A new page has begun in the village chronicle. As mayor, what will your legacy be? Will you be known for your great civic works? For your service to the church? For making the village a commercial mecca? Or will you be remembered in the stories you tell and in the stories you’ve saved from disaster? It’s your village. What kind do you want? 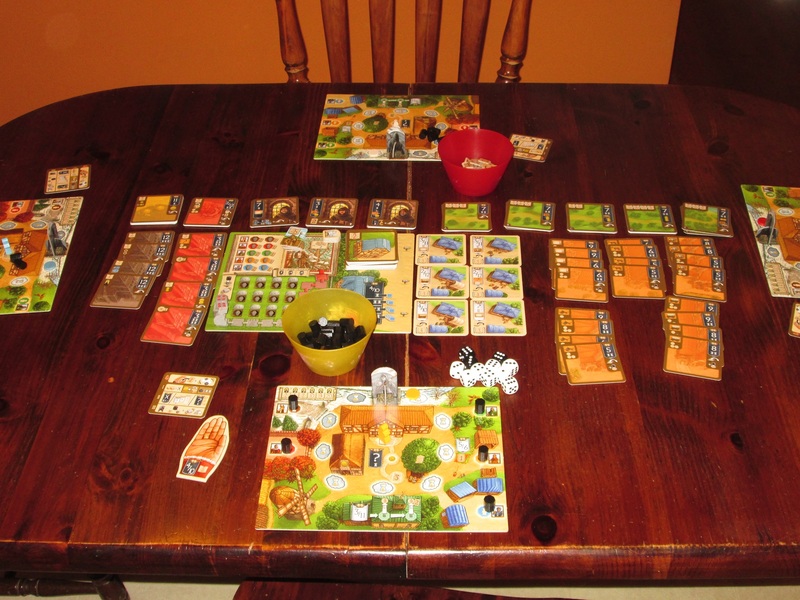 My Village is a dice-drafting Euro game for two to four players. Players seek to build their personal villages to generate the most prestige. 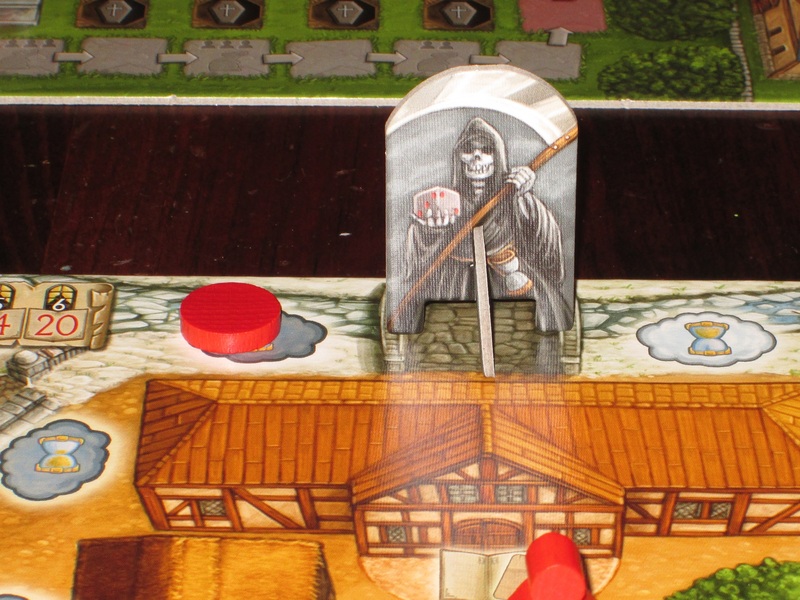 The player with the most prestige when a predetermined number of villagers die will be the winner. My Village set up for four players. There are a lot of pieces to get in the right spots. Each player receives a personal village board and places one villager in each of the villager spots. The communal board is placed within reach, and the different cards are laid out. Players decide on a starting player, and each player receives some starting money. 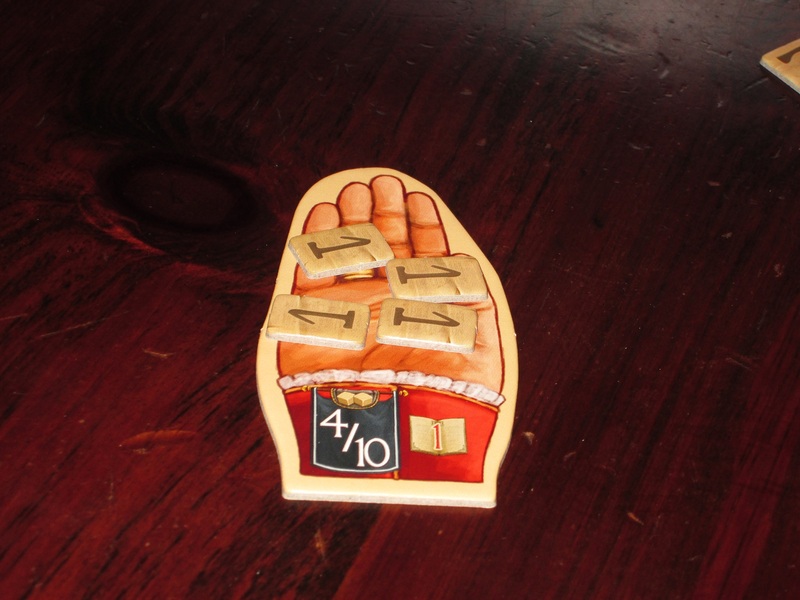 At the start of each round, the player with the starting hand adds one story point to the hand and rolls the pool of dice. 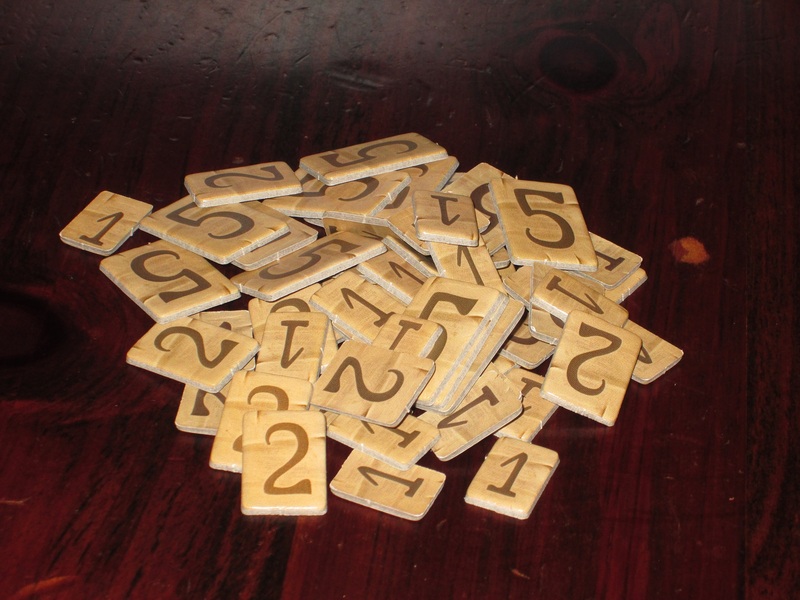 Then, beginning with the starting player, each player chooses two dice and performs actions. 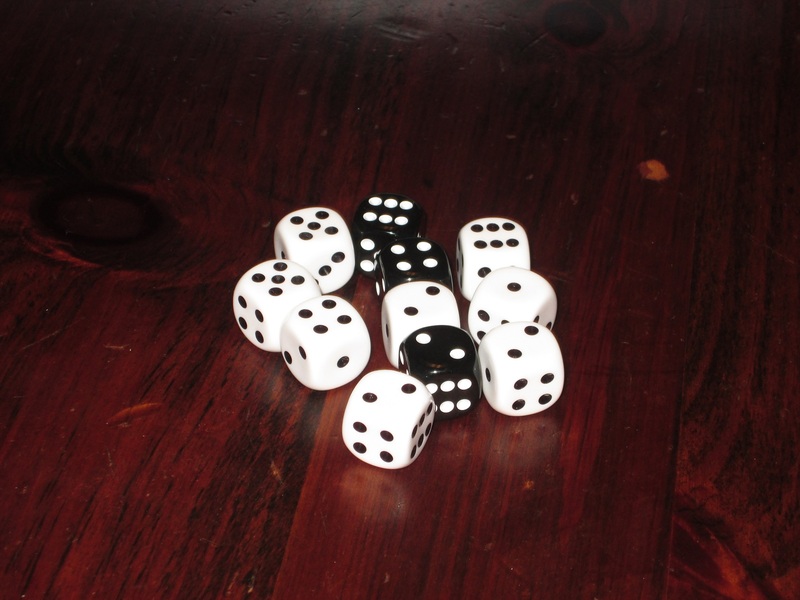 Using the sum of the two dice, players may perform either one black banner action or as many white banner actions as they can that use the same number. Black banner actions are primarily about building infrastructure and usually involve adding new cards to the village, which will on future turns provide white banner actions. Players may also claim the starting player hand (and any story points on the hand), build the church, travel down the road (for straight prestige points), or bank their story points as black banner actions. White banner actions include things like training new villagers, producing goods, or fulfilling customer orders. “Because I could not stop for death, he kindly stopped for me.” Death awaits all of us in village life. It’s inevitable as most actions require the passage of time. Most actions in the game cost time, which is recorded on each player’s personal village board, and whenever a player’s time marker crosses the bridge, death will claim one of that player’s villagers (which prevents the player from using actions associated with that villager). Then that player rolls the rat die, and when the rat figure reaches the end of the road, each player loses half of their unbanked story points. The game ends when a certain number of villagers has died. Players count up their prestige points gained from the way they’ve built their villages and from any banked story points. The player with the most points is the winner. 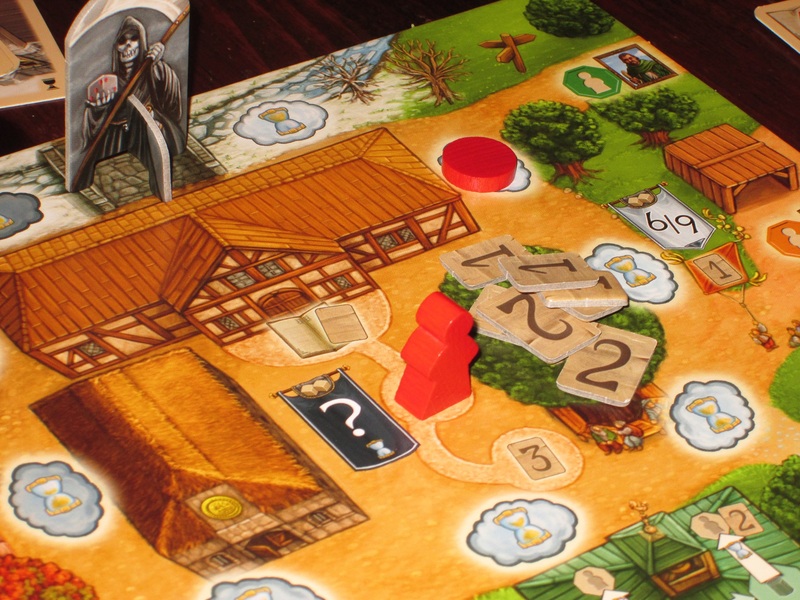 My Village is the dice game spin-off of the Kennerspiel des Jahres-winning Village. Historically the term “dice game spin-off” has signaled a watered-down offering for mass appeal. But with Roll for the Galaxy and now My Village, the term is being redeemed. These dice games are full, interesting, hefty games in their own right that rebuild concepts of the ancestor game in a wholly new dice environment. 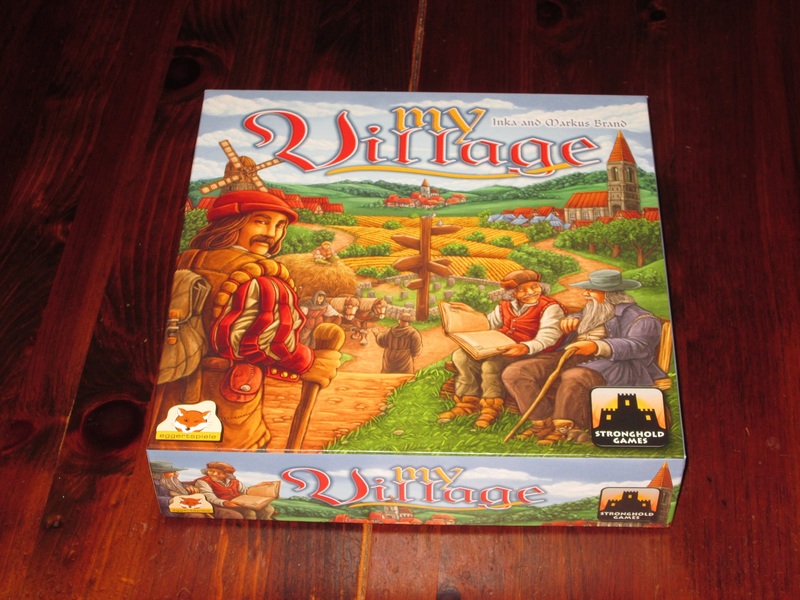 For my part, I’ve never played Village, but I’m familiar with the premise, and My Village carries over several thematic signatures. There’s the passage of time, the death of villagers, and the wealth of options for building up your village. The player aid in My Village is pretty clear. And, oh boy, are there lots of options in My Village. Players can tailor their villages to whatever their hearts decide. (Take the customization implied by “my” seriously.) They can rely on the abbot and build their church. They can use their councilman to tailor their board to maximize point efficiency. They can produce goods with their craftsman and sell those goods to customers with their merchant. Or, if the road beckons, they can leave village life behind and see the world, earning straight prestige in the process. Generally, players will have to do some combination of things to win, but since players can only activate one black banner per turn, they will also have to specialize. Each of the four churches and four council chambers is unique, so these can aid players in knowing where to aim their efforts. Story points are points earned along the way. However, they aren’t worth anything until they are stored in your village hall. Complicating things is that time passes. Your villagers aren’t cold machines that keep working and working. Eventually death will claim your villagers, leaving a void in the work that needs to be done. You can’t take actions associated with a dead villager–for example, if your craftsman is dead, you can’t produce goods or build new craft buildings. So if you want your village life to run smoothly, you have to have a succession plan in place. The school is thus a central feature of the game. But as anyone with kids will tell you, education takes time–both in playing the game and in resource terms. Players have to balance keeping their village running with taking time to educate the next generation. I like thematic touches like this. The chronicle catalogs important villagers who die (i.e., provide prestige). The rest of the deceased villagers are buried in unmarked graves. The passage of time is one of the strongest features in the game. Everything players do costs time. At the start of the game, time seems to move so slowly. “Really? We’re an hour in, and only that many villagers have died?” But the game moves more quickly as players fill their villages with white banners. You can activate as many white banners as you want on a turn (as long as they share the same number), but each one will have its own time cost. In addition, players will draft dice for each turn. It’s a boon if players can draft all white dice, which come with no penalty, but occasionally the allure of the black plague dice will be too enticing to neglect, and each black die selected forces the player to spend two additional time–a precious resource when villagers’ lives are on the line. One of the options players have is to build their church, worth more and more points as windows are added. In addition to managing time, players have to balance black banner actions and white banner actions. Taking a black banner action on your turn is a little bit of a bummer because you only get to do one thing, but black banner actions are what place more white banner actions in your village, making later turns more efficient and rewarding. It’s fun to chain together several white banner actions on one turn, and creating combos will make you feel clever, but in order to make it to that point, you have to take some turns that, while rewarding, are less fun. Moving the mayor can happen on any turn, but it feels like a waste. Then again, banking points before the rats arrive is definitely worth it in some circumstances. Perhaps the least “fun” thing to do on your turn is to move the mayor. The mayor sits in the village hall and walks along his path, earning coins or story points as he moves. When the mayor returns to the village hall, any points in your story tree get moved to the village hall and count as prestige at the end of the game. This is boring to do, but necessary. Each villager death brings closer the threat of plague, which will disrupt the village’s story tree. While I hate wasting turns moving the mayor, the tension of watching the rat and of weighing whether it’s worth it to let my points dwindle or to spend my turn moving the mayor is a welcome one. My Village doesn’t have a lot of tension, and in that respect it is a very friendly game. It’s pleasant. It gives each player space to determine the destiny of their villages. 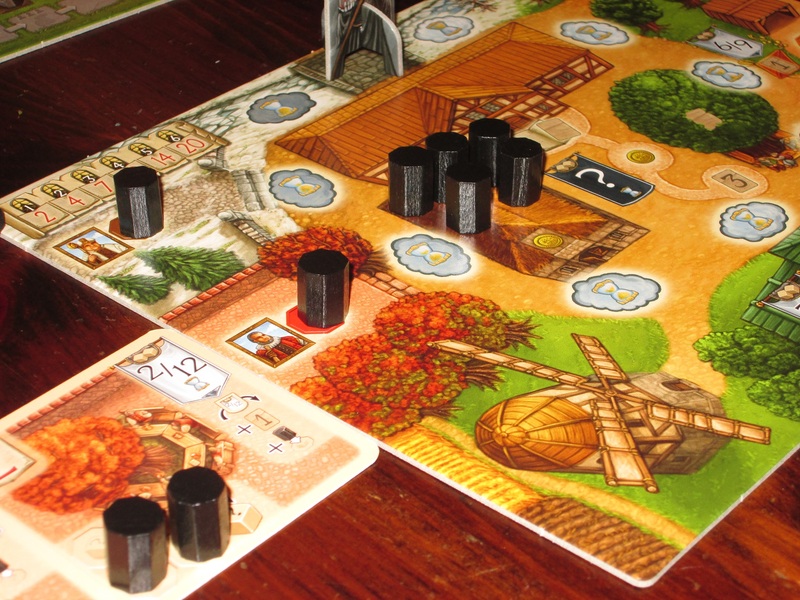 But for me, while I didn’t not enjoy the games of My Village that I played–I did–if I’m spending the time to teach and play a longer game, I’d probably rather play something else. 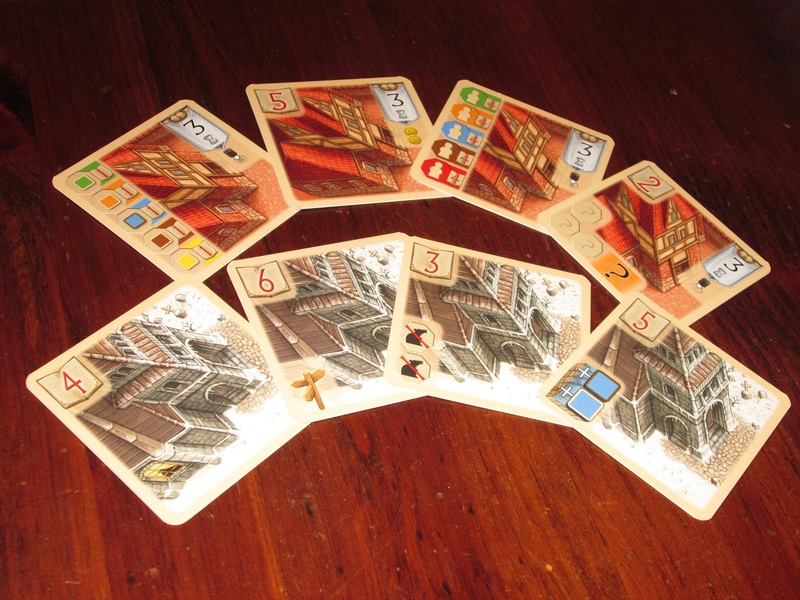 The main way to differentiate villages is with church cards and council chamber cards. I’m generally a fan of Euro games, but one thing that’s important to me is player interaction. That is, what other players do should have a direct impact on what I do. I’m not looking for conflict (although even that is welcome when it’s well done); rather, if someone takes something, I want to feel the ache of missing out. (Or, stated perhaps more accurately, when I take something, I want the other players to feel regret.) There’s some of this in My Village. Players draft dice from a common pool, and when someone takes what you want, you have to choose different dice that might not be so congenial to your plans, or you might have to choose plague dice. Similarly, the craft buildings activate on different numbers, and if you wanted a certain number, you might be out of luck if someone else gets there first. 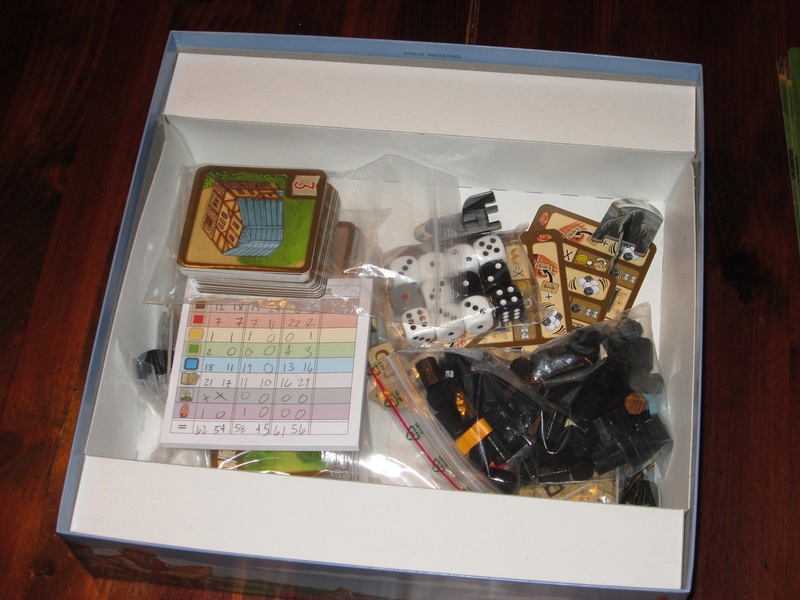 The dice pool for a four-player game. The black dice are plague dice and carry a penalty of 2 time if they are chosen. But where My Village falters (at least for me) is that while I can be rerouted by what other people do, it’s rarely more than a slight detour or even a minor inconvenience. There are enough ways to manipulate your dice–through paying coins or using your meeting place or taking plague dice–that you’re rarely stuck with a bad roll, even if you choose your dice last. And even when you do get a roll that isn’t your preference, there are so many options on the table that you can likely find something worthwhile to do, even if it’s just moving the mayor to (eventually) bank your story points. If someone takes the craftsman card you want, it’s no big deal; there’s one card in the game for each player, and you can claim one of a different number. This might lessen the synergy of future turns, but you’re never fully out of luck. The start player hand is usually passed over–it’s a black banner action that takes your whole turn! But once enough story points get added, it can be a tasty option. “Multiple paths to victory” is almost universally praised in games, and I’m generally in favor of this too. I like when someone can pursue one strategy while I pursue an entirely different one and still remain in competition for the goal. But it’s the competition that is key for me–the paths have to converge. 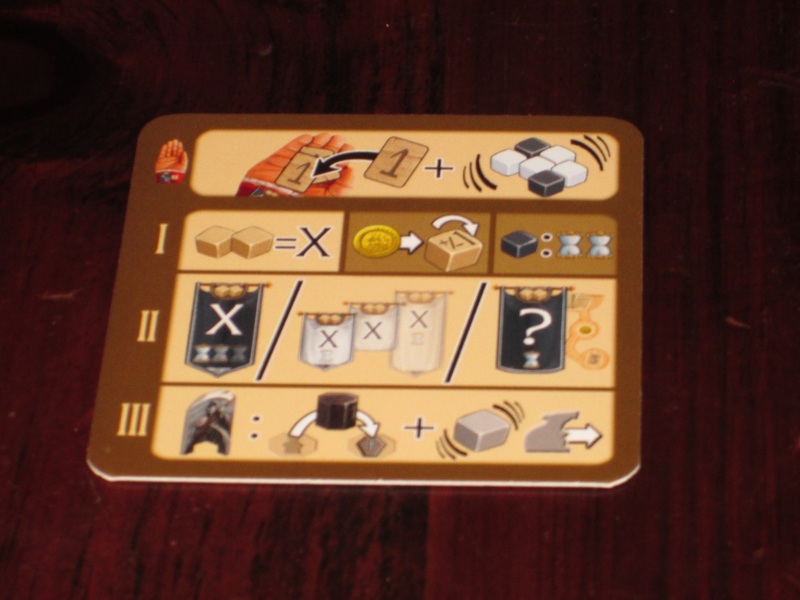 I think Concordia, a recent favorite of mine, is exemplary here: play occurs on a central board, and players directly compete for placement and resources, but they are pursuing different avenues for points. My Village, by contrast, feels like players are playing completely different games. Each village is seeking its own prestige. One achieves it through hoarding (and finally banking) story points; another by building a medieval megachurch; another by fulfilling lots of customer orders; another by scoring lots of bonus points through the council chamber cards. It’s kind of neat to see individual villages develop differently, each with its own personality, but at the end of the game, I realize that while we’ve sat at the same table and we’ve been participating in a common activity, we haven’t really been playing against each other. 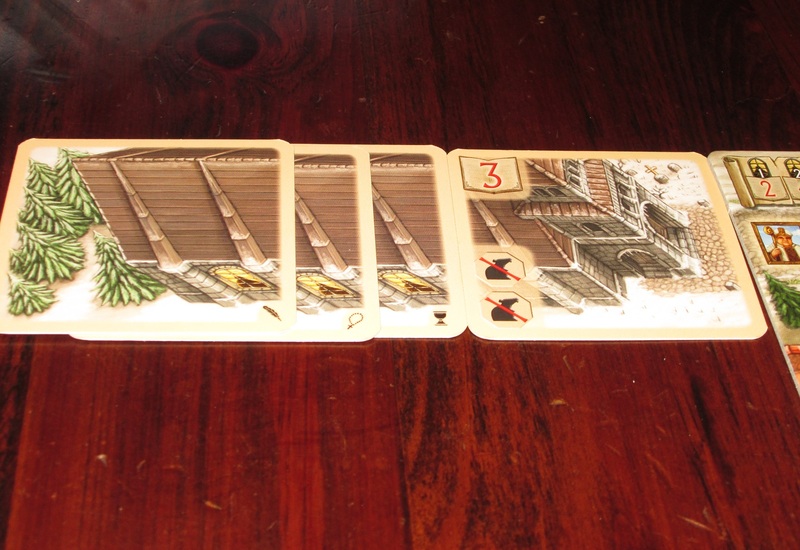 We’ve been locked in our own villages, and then when the game ends, one player is declared the winner. Winning and losing feels a little irrelevant because we haven’t been directly competing. It’s kind of like asking, does a whale swim faster than how high a frog can jump? It’s hard to compare the two because you’re measuring different things. 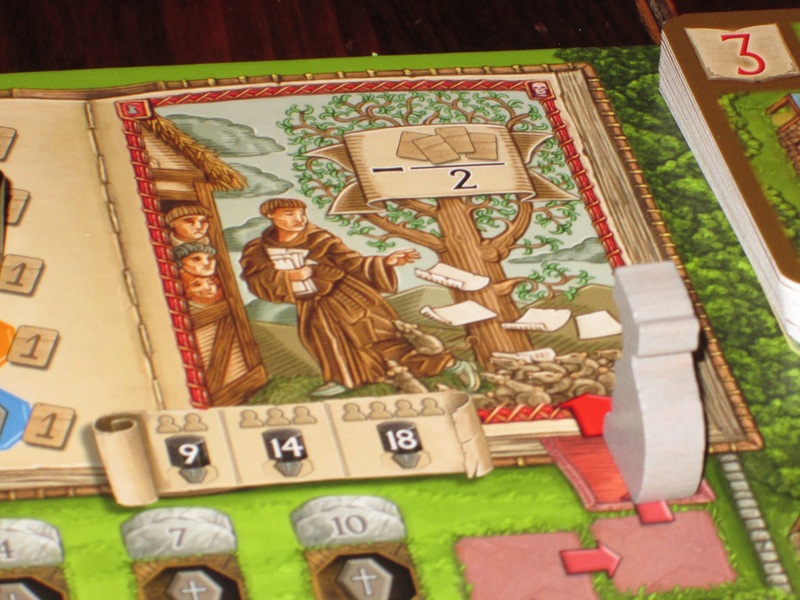 Games like Orleans and My Village, obviously, have their fans–even fans in high places (Orleans was nominated for the Kennerspiel des Jahres, and My Village’s ancestor won the award). And the trend in Euros seems to be toward friendlier, more open ended, sandboxier games, where players can develop their personal boards according to their whims. My Village fits this mold perfectly (with its own mechanical innovations), and it might be the friendliest of all. There certainly is some enjoyment in managing village life from fledgling crafts through a more productive period of industry (without Agricola‘s ulcer-inducing mandate to feed your family). So just because it’s not for me doesn’t mean it’s not for you. Black markers track most things in My Village. What they lose in individual piece character they gain in efficiency and saved table space. My favorite piece of art from the game. And the rat looks on triumphantly, ready to feast on stories. The game advertises play for two to four players. I think the two-player game is my preference. For one thing, it’s your turn more often. For another, since the game is fairly solitary already, having more people at the table doesn’t matter as much (although the dice drafting and card selection is certainly more interesting with more players–although, again, even with four players, I rarely felt locked out of anything I wanted). Tastes will differ here, and it’s not bad at any count. Turns should move briskly once everyone knows what they’re doing, so even downtime shouldn’t be a huge issue. My Village hands players the keys to the village and puts them in the driver’s seat for that village’s development. There are a wealth of options for how players can develop their villages, and while for my taste there are too many options (which reduces tension and competition), I think the clever mechanics and friendly play style will appeal to conflict-averse players, and the theme and artwork are attractive in their own rights.While My Village doesn’t excite me, if you’ve ever wanted to be mayor, My Village provides you the opportunity you’ve been looking for. The chronicle awaits. 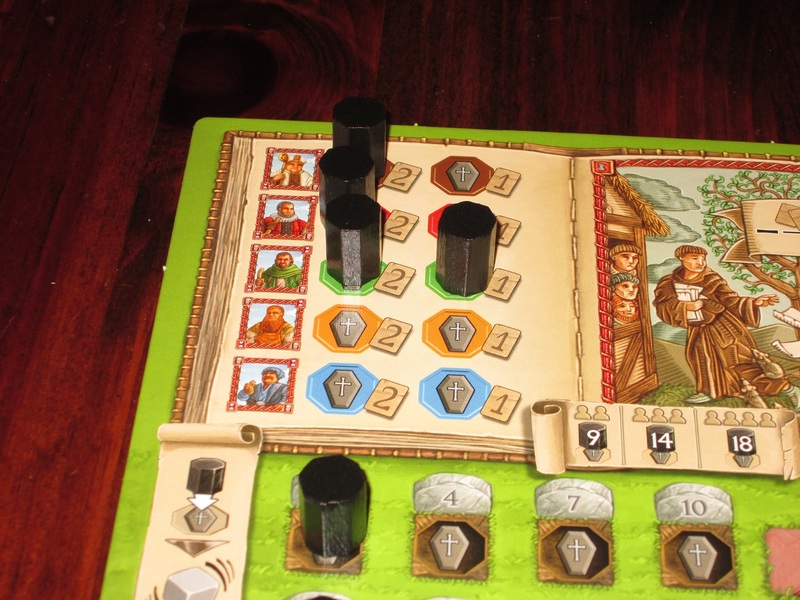 iSlaytheDragon would like to thank Stronghold Games for providing us with a copy of My Village for review.